Just as we thought we’d seen the last snow for a while, we wake up to another winter wonderland. 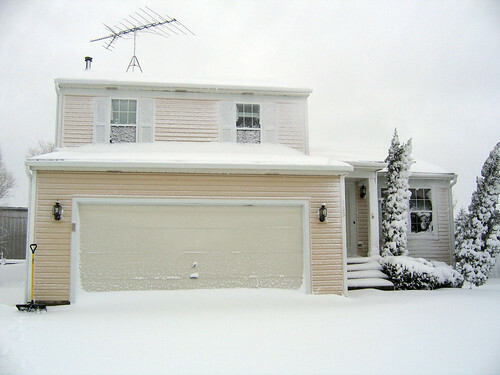 One week into spring and we had an overnight snowfall of 6 to 8 inches (15 to 20 cm) here in northern Illinois. March had been very mild until now, with temperatures in the 70s (20oC+) in recent weeks, but it looks like we have to get our shovels out one more time. 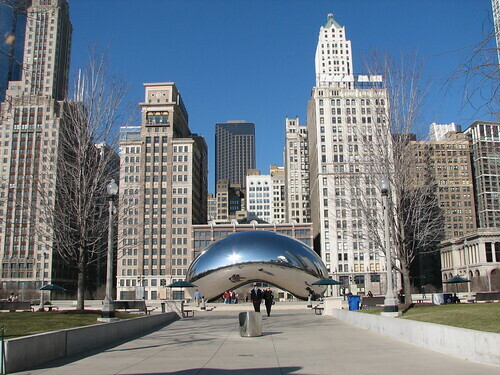 Springtime snowstorms are hardly out of the ordinary in Chicago. The record for total snowfall in March is 23.1 inches in 1926 and the record for total snowfall in April is 13.6 inches, back in 1938. This 25-foot sculpture by J. Steward Johnson is called God Bless America and was installed on Pioneer Court in Chicago last December 2008. 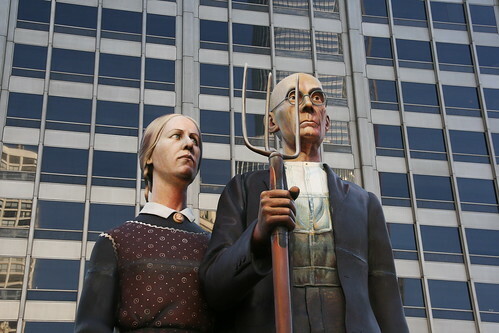 It is based on one of the most famous American paintings, American Gothic (1930) by Grant Wood, which is in the Art Institute of Chicago. In this video some guys strapped vests with lights onto sheep and had them run around in specific patterns to create art on a hillside in Wales. They even have them play pong! I’m not sure if it’s fake or not, but it’s still a pretty crazy idea. What is this for? A Samsung commercial? Very weird indeed! Happy Saint Patrick’s Day everyone!! 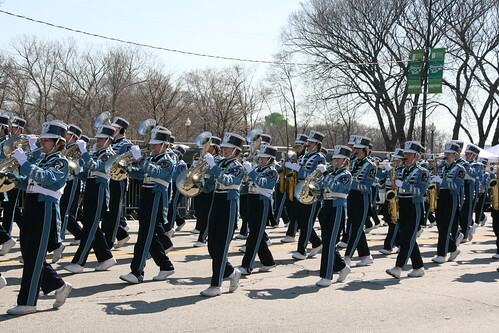 Last Saturday we went to downtown Chicago to witness the Chicago River going green and after that we walked to Grant Park for the annual St. Patrick’s Day Parade, which started at noon. 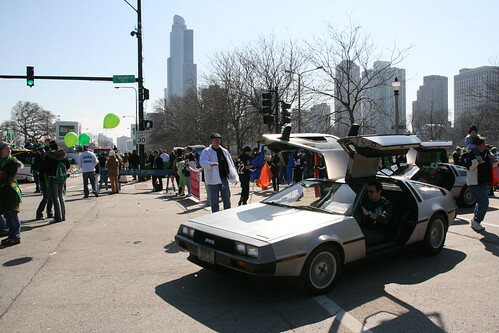 The parade lasted for about 3 hours, which was really too long, but it was still fun. Lots of groups gave out free stuff (like green hats, beads, candy, etc.) and it was a sport trying to get as much as you can (we didn’t get much though). 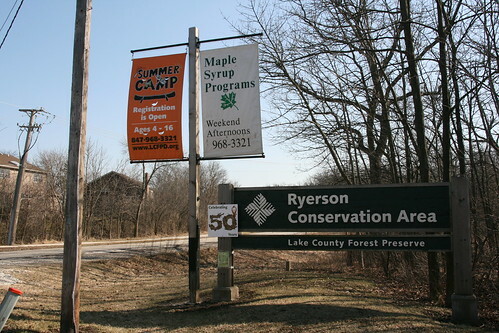 Today we participated in one of the Maple Syrup Hikes at Ryerson Conservation Area. On the one-hour program we learned about the Sugar Maple trees that make sweet sap and how they tap them to make syrup. I love maple syrup on my pancakes and waffles and have always wanted to see this. Pirates of the Carribean 2: a rip-off of Monkey Island?